For the last 18 years I've celebrated Kwanzaa with family and friends. Our local alumni celebration grew to the largest in the Miami area. There have been some really great times throughout the years. The objective was to see the project grow in number of people who attended and participated. We also wanted to witness the manifestation of the result of practicing the Nguzo Saba (Seven Principles) in the local community. Unfortunately, my mom, who has been the chairperson of the vent has fallen ill this year and Miami-Dade County continues to reduce its level of support and we will not be able to present the community celebration as we had in the past. Initially I was extremely disappointed in this. I racked my brain trying to figure out how to make it work short of coming up with the money but time was running out and we really should not be required to go through such drama considering the monies the County has squandered on projects that were to benefit the community. Then it dawned on me a break was really needed. It is time for us to really develop a plan so that we live Kwanzaa rather than celebrate for a week and then go about our either practices that are either non-productive or downright destructive. 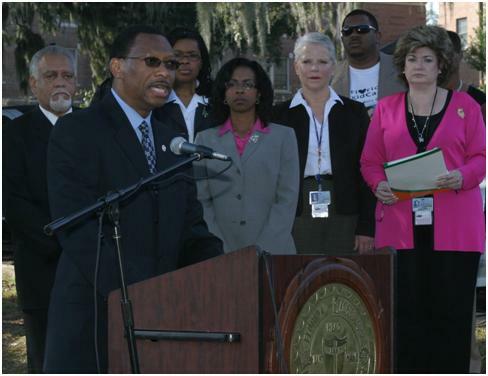 The second we must do is draft a long-range plan that is much less dependent upon the County. That is really what Kwanzaa is about anyway. 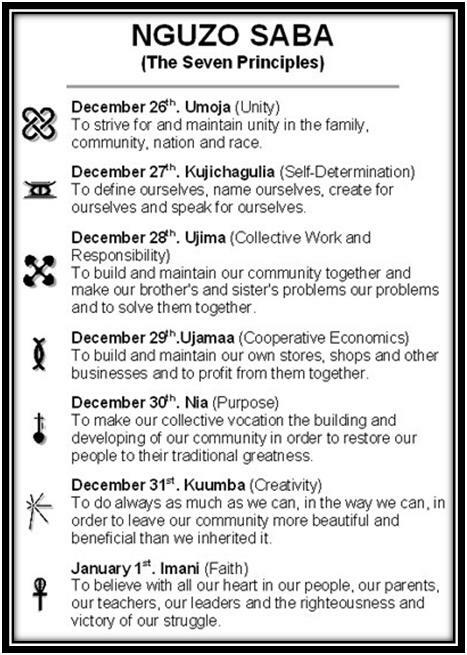 It's time to keep the focus of Kwanzaa before the people year-round. Some people still don't get Kwanzaa. There is a perception that it is anti-Christmas; I've even had some folks say it's satanic. Hmmm. 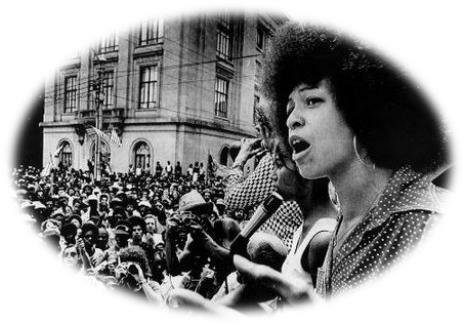 There are people that point to Karenga's incarceration for torture and imprisonment of women from the US organization. Kwanzaa is not satanic and it's not anti-Christmas. We celebrate Christmas and Kwanzaa. There is a non-religious, non-political requirement to Kwanzaa and that may be what throws some folk off. I won't get into the whole commercialization of Christmas because I think many already get that. Christmas, as we know it, has far too little to do with the birth of Jesus Christ. In my humble opinion, Kwanzaa is becoming commercialized also but I'll leave that for another post. Kwanzaa encourages careful consideration of gifts given to children. Books and other items that will expand their academic and cultural horizon are strongly encouraged. 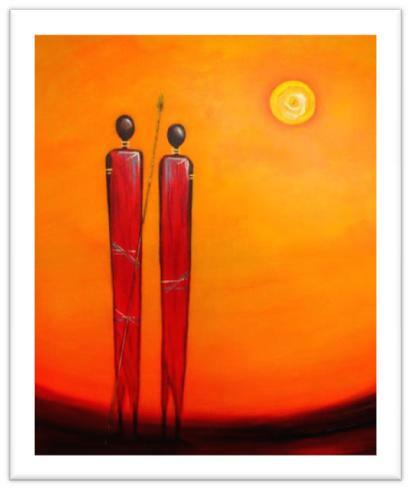 Kwanzaa also encourages family bonding, love and respect for one another. 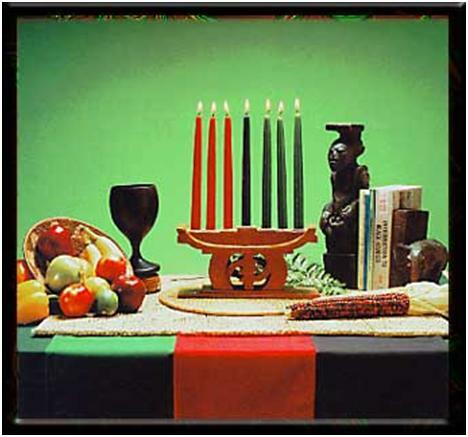 Kwanzaa recognizes that family members frequently have different religious beliefs. I know those different beliefs have been the root of awkwardness for many my own family's celebrations. Through pure Kwanzaa practices, we can celebrate together. Now, for Kwanzaa creator Maulana 'Ron' Karenga's criminal past, I don't ignore it but I also don't see the wisdom in ignoring the positive messages of Kwanzaa because of one person. So, how exactly do I plan to live Kwanzaa? For starters, I'm going to patronize a black-owned business at least once per week. Even if the product or service is cheaper at another store, I will support black business so that we build, maintain and profit from our own stores. Through my blogs, I'll share information that will benefit the collective and encourage exchange of ideas about community issues and possible resolution. Knowledge is power and we often have a better solution for our community problems than those elected or selected to resolve them. More important will be the use of my blog to recognize young people who excel academically, demonstrate entrepreneurial skills or give back to the community. My 2008 will be about action, staying positive and developing future leaders. Peace. During the Kwanzaa ceremony, Kukumbuka (Remembering), the ancestors and those who have lived and applied the Nguzo Saba (Seven Principles) with songs, poetry, literature, music or deeds are remembered and honored. It is in that spirit the names of individuals who transitioned during 2007 are listed below. Feel free to leave a comment including the name of your loved one who passed away this year. Chad Butler AKA "Pimp C"
Harold Madison Jr. AKA "Mr. Butch"
Kutoa majin is the calling of names of family members, ancestors and African-descended heroes to invite their presence. As the proverb says, "As long as someone is here to speak your name, you exist." We first call forth beings of the past — family members, leaders and teachers who left us a place on Earth to harvest our success. Please call out your deceased loved ones now. Next we call out the names of those who are living now – our partners, friends, family members and co-workers. Please call out your living loved ones now. Finally, we call on the nameless, faceless, formless children of the future. We ask a moment of silence for them because they have not been named, but we feel their presence. We feel their light because the work of freedom, dignity and prosperity must continue and we leave a legacy of triumph for them. Since I started blogging, I've met some great folks online. The brilliance that permeates cyberspace is often mind-boggling to me. Where did these folks come from and why don't more people know about them? For my offline friends that aren't bloggers, sometimes it's difficult to get them to understand what blogging is and why it has become so powerful. Not until I talk about the Jena 6 does it seem to kick in for many of them. I show them posts from fellow bloggers months before Al Sharpton, Jesse Jackson and Michael Baisden got on board. Then I tell them about Genarlow Wilson and Shaquanda Cotton. 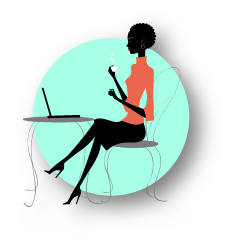 I also tell them about Black bloggers that post bout business, personal finance and money-making tips. In 2008, I'll introduce you to several bloggers via "20 Questions with __________." Some of them you may know and I'm glad to have them on my blogroll. Others may be new to you. Either way, 20 Questions is intended to be fun and a quick read. Look for the kick-off of this segment with a blogger definitely scoring big on the internet. Be sure to check back as we welcome the New Year on January 1st to see who it is. Why folks are so upset that Oprah has an opinion and is sharing it is nothing short of astounding. Here's commentary by Patricia Williams that weaves the Obama-Oprah phenomena and the impact of Denzel Washington's new movie, The Great Debaters. By Patricia Williams, The Nation. Posted December 19, 2007. 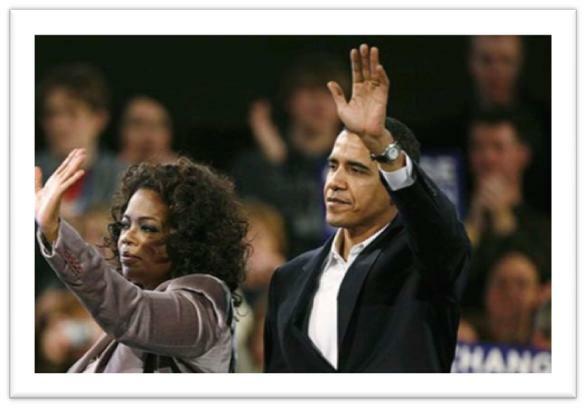 "…I'm intrigued by the brouhaha attending Oprah Winfrey's decision to endorse Barack Obama's candidacy. The Internet is positively foaming at her decision to campaign for him. Celebrities -- from Toby Keith to Sammy Davis Jr., from Barbra Streisand to Jon Bon Jovi -- have always stumped for candidates, but a lot of people seem to feel that Oprah is different. She's not a background singer; she is no mere decorative backdrop. Oprah can turn a book into a bestseller!, fume the blogs. When she lends her magic touch, it's somehow complicated or even unfair. I suspect that some of the controversy comes from those who like Obama and don't relate to Oprah's television persona, or vice versa. But it's interesting to contemplate: what does it mean that some people are so concerned about whether this particular celebrity ought to express herself in the political realm? Forty years after the Civil Rights Era, African-Americans are falling further behind whites economically. The American Dream, or a Nightmare for Black America? By Joshua Holland, AlterNet. Posted December 17, 2007. Do check out this article by Joshua Holland from AlterNet. There are a number of links to research and other coverage. Here's just a tiny bit of it. Startlingly, almost half (45 percent) of black children whose parents were solidly middle class end up falling to the bottom of the income distribution, compared to only 16 percent of white children. Achieving middle-income status does not appear to protect black children from future economic adversity the same way it protects white children. 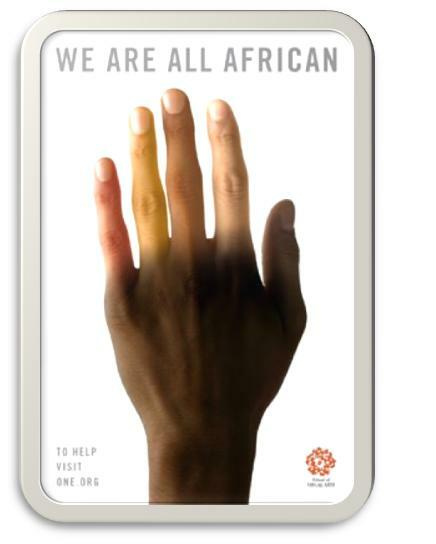 In May of last year I surfed across an article spotlighting the philosophy of a gentleman by the name of Christopher diCarlo who espouses that all people are African. His position was not unique. I'd heard it before and it is one that my Dad told me when I was very young. What was different to me is that Dr. diCarlo is not black, at least as it relates to the color of his skin. I'd read black scholars' position on origins of race but whites or anyone who could claim to be white didn't particularly admit to that --- at least to my knowledge. Skin color is one thing but racial origin another. Dr. diCarlo and I exchanged e-mails a couple of days ago as he commented on my post on Vanessa: Unplugged!. He is an amazingly brilliant man and I hope to sit in one of his lectures one day. Let me know what you think of the article about him and his position that "We Are All African". I surfed across this video of Common's endorsement of Barack Obama for President. The success of Obama's candidacy in the face of naysayers who proclaim him "un-electable" speaks to the ever-growing number of Americans who want change in our government. Whether Barack Obama wins the Democratic nomination for president remains to be seen. He has galvanized a real Rainbow Coalition of Americans ready to see this country move back toward a "people-centered" government rather than government for and by a few folks. Please share this video with your friends. Vote for Barack Obama. Thanks. When I was a kid, I remember flipping through the pages of my mom's DANCE magazine and admiring the movement of the dancers in the amazing photographs. I recall reading about Carmen de Llavalade, Geoffrey Holder, Alvin Ailey, Judith Jamison, Arthur Mitchell and other prominent dancers. I don't recall reading about Janet Collins, America's first black prima ballerina. Ms. Collins passed away in May 2003 at 86 years old. As expected, Ms. Collins faced extreme difficulty in learning and displaying her craft. 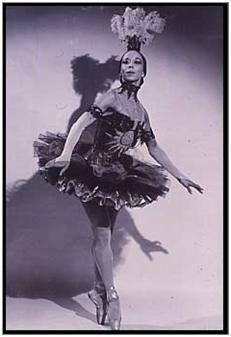 At 15, Ms. Collins auditioned for the Ballet Russe de Monte Carlo and was told she had to perform in white face. She refused. Ms. Collins was truly a dance pioneer. 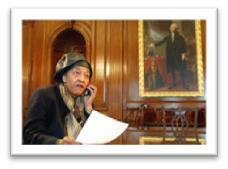 Read more about her at http://search.eb.com/blackhistory/article-9399731.